Car analogies are cliché in the audio world, but when I began reviewing MEElectronics’s $129 A161P Balanced Armature In-Ear Headphone with Inline Microphone and Remote (let’s just call it the A161P), the first thing I thought of was a “sleeper”: a car that looks modest inside and out, but packs serious power under the hood—the Volvo 850R wagon is a great example. By saving money on exterior finish and interior luxury, extra resources can be put into the bits that make the car go fast. (There’s the bonus that the car doesn’t attract undue attention, but that’s tangential here.) The A161P is a sleeper headphone. Although the A161P doesn’t look cheap, it doesn’t look particularly fancy, either. 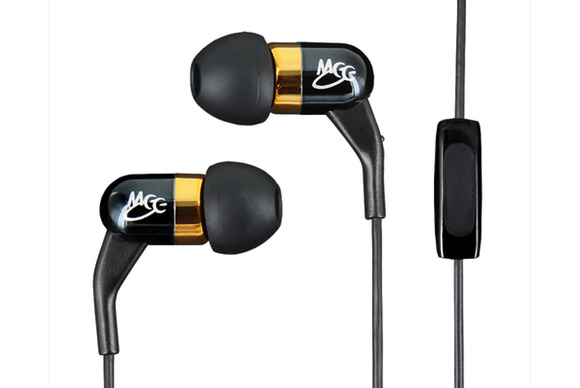 The earpieces are small, black capsules printed with the company’s “MEE” logo and capped with a gold-colored nozzle that guides sound into your ears. That stem hosts a standard silicone eartip that allows the earpiece to seal in your ear. On the opposite end of the earpiece, substantial strain relief supports the headphone cable. On the cable for the right-channel earpiece sits an inline, one-button remote and microphone module. (One of the missing luxuries here is a three-button, Apple-style remote/mic.) The cord itself is thin, but it feels reasonably sturdy, and it terminates in a 45-degree-angle, 3.5mm (1/8-inch) stereo miniplug. MEElectronics includes a solid “options package” (that is, accessories): a zippered, semi-rigid carrying case; removable cable-guide ear hooks to stabilize the A161p’s fit; a shirt clip; an adapter for connecting the A161p to a computer’s separate headphone and microphone jacks; and an adapter for some non-iPhone smartphones with different headphone-jack wiring. The A161p also includes an extensive fit kit, with three sizes of single-flange eartips, two sets of triple-flange eartips, and one pair of double-flange eartips. In use, I found the A161p to be comfortable and easy to fit and wear. However, the cord has a some “memory effect” to it that causes it to coil in annoying ways, the split portion of the cord feels a little thin, and the remote feels slightly fragile, with some play in the fit between its two halves. The A161p’s cord can be worn normally (with the cables hanging down) or up (with the cables routed up and over your ears). I almost always find that the latter style offers a more secure fit and reduces mechanical noise from the cable; that was the case here. But as with a sleeper car, it’s what’s hiding under the hood—or, in this case, inside the earpieces—that counts, and the A161p features balanced-armature drivers, a type of miniature speaker used in many high-end headphones. The actual driver is from the Knowles ED series, a family of drivers found in well-respected (and generally more expensive) models from other companies. That makes the A161p potentially a great bargain, but, to continue the car analogy, you don’t know whether a nice engine makes car a perform well until you take it on the track. Balanced-armature drivers are known for their relatively neutral frequency response, with approximately equal amounts of bass, midrange, and treble frequencies. But they can also sound overly polite, whereas dynamic drivers sometimes sound more exciting and, well, dynamic. I found that to be the case with another balanced-armature model from MEElectronics, the $75 A151 (4 of 5 rating)—I liked the A151’s relatively flat frequency response, but I thought it was unexciting at times, and I missed the bass impact you frequently get from dynamic drivers. In contrast, I found little to complain about with the A161p. Bass—even lower bass—was not only present, but convincing. There’s a case to be made that the A161p might benefit from a slight bass bump (this is arguably true for all headphones, because they don’t move the air in the room the way full-size speakers do), but otherwise, bass performance was almost beyond reproach. Midrange and high-frequency performance was similarly impressive. Both were clear and detailed, with no high-frequency harshness on good recordings. Instruments were clearly separated in the mix, making it easy to pick out individual parts of a song, as well as the instrumental textures of those parts. Overall, the A161p’s sound was clear, detailed, and natural. The only thing I can really say against it is that if you spend more money (probably a lot more money), you can get higher-end, multi-driver canalphones with sound that is even clearer and more natural. But I don’t believe you can find substantially better sound near the A161p’s price. In terms of the A161P’s microphone performance, I found the mic to sound a bit distant compared to the one in Apple’s EarPods (which offers the best sound I’ve heard from an inline microphone module). However, vocals captured by the A161P’s microphone were nevertheless smooth and natural, avoiding some of the harshness that I heard in the EarPods. Overall, the A161P’s microphone offers solid performance. As I stated, the A161p is a significantly better performer than the A151. The A161P’s more aggressive (but not overdone) bass balance makes a big difference, but the A151 also just sounds somewhat veiled and distant in comparison. I also compared the A161P to another long-time favorite, the $99 Etymotic mc3 (4.5 of 5 rating). The mc3 (which has a dynamic driver but shares sonic characteristics with the rest of Etymotic’s balanced-armature-based line) still sounds great, but as I’ve continued to use it in the two years since my initial review, I’ve found myself missing the more-prominent bass response of other headphones, particularly in the low bass. The mc3 has a more lively high end, and it puts up a good fight, but I prefer the A161P’s solid bass performance, and I find its sound to be more natural overall. Depending on street prices, the A161P can be had for anywhere from $10 less to $50 more than the mc3—at any of those prices, I think most buyers will find the A161P to be a better overall value. When I reviewed Velodyne’s bass-emphasizing $99 vPulse (4.5 of 5 rating), I noted that “The vPulse is impressive enough that I recommend it to anyone shopping in the $100 price range, unless you’re certain that you want more-neutral performance.” Since then, some people have asked me the obvious follow-up question: What headphones in this price range do you recommend for a more-neutral sound? The A161P is a compelling answer to that question. Both headphones have similar street prices, and both sound great. The vPulse offers significantly stronger bass performance (and a three-button remote/microphone module), while the A161P is much closer to neutral, with a clearer, more-natural sound for better overall performance. I didn’t have the opportunity to directly compare the A161P to a higher-end set of canalphones, but I previously reviewed Shure’s $250 SE315 (4.5 of 5 rating), another single-driver, balanced-armature headphone. Based on my recollection, the A161P comes very close to the SE315’s overall performance, and offers a bit more bass output, for a significantly lower price. MEElectronics’s A161P looks modest, but it offers impressive value at $129—and even more so at street prices. I don’t think you can find notably better sound without spending more than $200, or maybe even $300. Listeners that want huge bass, need an Apple-style three-button inline remote module, or are willing to pay significantly more for higher performance should shop around, but the A161P offers such impressive performance at its price, with so few drawbacks, that I recommend it for just about anyone. MEElectronics’s A161P looks modest, but it offers impressive headphone value at $129 (and even more so at street prices). It’s easy to recommend for just about anyone.